The tools of digital filmmaking are transforming all aspects of cinema, including production, postproduction, and exhibition. 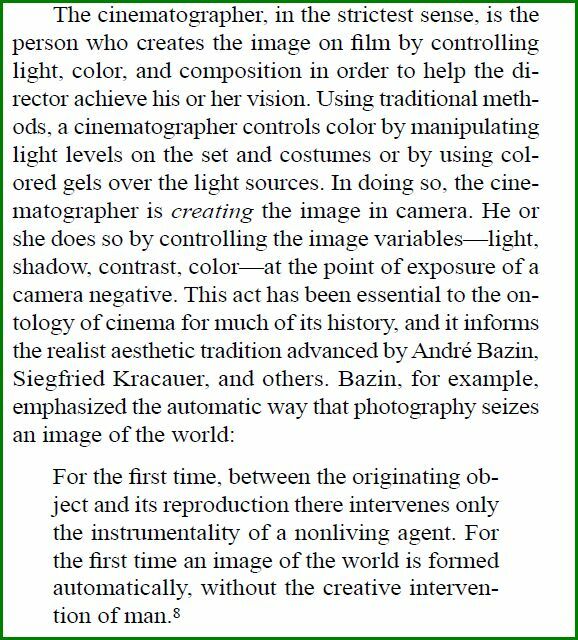 In the process, they are altering the visual characterisitics of the moving image and changing the viewer’s perceptual understanding of the nature of cinema, leading to the emergence, for the first time in the medium’s history, of filmic artifacts. ….”reads” a scene very differently than film does. One of the unmistakable hallmarks of DV is its clarity and depth of field. DV tends to record everything in deep focus and with extreme sharp focus, whereas varying degrees of shallow focus are the norm for images shot on film. Most shots have a limited focal plane, as determined by the speed of the film, the f-stop and the amount of light available. Even celebrated deep-focus films also include numerous shots where the focal plane is restricited. In contrast, DV produces deep focus as a kind of auto-default, and filmmakers working in the format studiously try to avoid this look. Price wonders what Bazin, who advocated deep focus, would think of DV, suggesting he would have thought it good. But he then goes on to consider the paradox of film looking more alive than DV, despite being grainy. Films like Lawrence of Arabia, North by Northwest and Citizen Kane that have been digitally re-mastered for DVD have a very different feel from the film versions. A few other important differences between film and digital are mentioned.